Moving before the holidays can be stressful, especially as you try to fit in shopping, decorating, and visiting with friends and family. You might be waiting to move until after the holidays, which means that this will be your last holiday season in your old house. At Billy Goat Moving & Storage in Fort Collins, we understand the emotional attachment that you may have with your home, and that you might have years of holiday memories that are attached to the house. If you’re moving in the next few weeks or months, then we can help you get everything to your new place. Even though you’re moving after the holidays, you still want your house to feel festive. You probably don’t want to put up every decoration you own, since you’ll have to take everything down in a few weeks’ time. However, you can do some minimal decorating to put everyone in the holiday spirit. 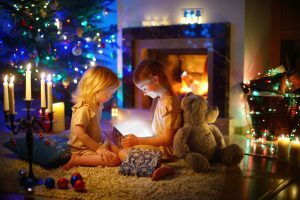 If you have kids, putting up the tree (even a small one) can help them feel more at ease about the upcoming move, since you’re still celebrating the holidays as you normally would. A few lights on the mantelpiece or a wreath on the door can help everyone enjoy the last holiday season in your old house. If you’re not moving until after the first of the year, then chances are you’ll have given and received all of the gifts for the season. With Hanukkah lasting until this upcoming Monday, and Christmas right around the corner, you may have plenty of gifts that you need to pack for your move. While you probably can’t keep the kids from wanting to play with their new toys, it can be a good idea to leave a few in their packaging until you get to the new house. You can even save a few wrapped packages and let everyone open a gift once you arrive! Be sure to leave room in your boxes and tubs for gifts and other items. You can always pack fragile items in the car and take them to your new place first, so that they’re out of the way and off of your mind. It can be hard to say goodbye to a house, especially one you’ve lived in for several years. Your kids have grown up there, and you’ve made lots of lasting memories. With a few decorations and special details, you can enjoy your last holiday season in your current residence, as well as look forward to making more memories in your new home. If you want a moving company that will help make your relocation as easy as possible, then contact Billy Goat today. We have the knowledge and experience necessary to move anything in your home, including your piano, safe, and artwork. If you have questions during the move, then we’ll be more than happy to answer them. Call us today at (970) 541-9121, or use the form below to get in touch with us.